quattro is Audi and Audi is quattro – the brand and the technology are indelibly linked. In celebration of the 30th birthday of the Sport quattro, Audi will present its legitimate successor at the 2013 IAA in Frankfurt am Main. The Audi Sport quattro concept show car continues the grand quattro tradition, with a stunning coupe design and plug-in hybrid drive with a system output of 515 kW (700 hp). One legendary Audi classic is the Sport quattro, which made its debut at the 1983 IAA and was designed as a homologation model for the World Rally Championship. With 225 kW (306 hp) and many technical innovations, it was the supercar of its day. The short wheelbase, which honed the handling, gave the Sport quattro an unmistakable look. The competition car wrote racing history. Walter Röhrl drove it to a convincing victory in the 1987 Pike's Peak International Hill Climb in Colorado, U.S.A.
With the Audi Sport quattro concept show car, Audi is bringing this grand tradition into the present and taking up ideas again that were first seen in the Audi quattro concept study three years ago. 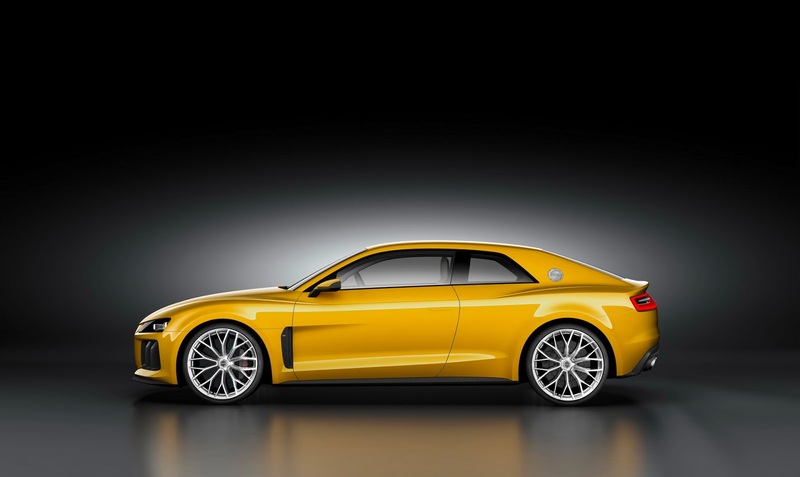 The coupe combines the DNA of the Ur-quattro with dramatic elegance. It has a powerful, intense road stance, its body tautly perched over the 21-inch wheels. The overhangs are short, the proportions sportily balanced. With a wheelbase of 2,784 millimeters (109.61 in), it is 4,602 millimeters (181.18 in) long. With 1,964 millimeters (77.32 in), the two-door model is very wide and at just 1,386 millimeters (54.57 in) unusually low-slung. Like the Audi Sport quattro, the Audi Sport quattro concept was designed in the spirit of racing. None of its design solutions are an end unto themselves. Each is driven by a technical function, and several are an homage to the quattro models of the early 1980s. These include the angular, flat C-pillars and the rectangular double headlights featuring Audi's groundbreaking Matrix LED technology, which will be available by the end of this year in the refreshed Audi A8. The proportions of the rear of the car are defined by the combination of a flat greenhouse and broad shoulders. The spoiler at the lower edge of the rear window underscores the car's width. Another distinctive element at the rear of the show car is the CFRP diffuser, which extends far upward. Similar to the single-frame grille, its upper section is honeycombed, whereas the lower section houses two large, oval tailpipes. Mounted on a black CFRP facing, the tail lights are rectangular – a typical quattro styling cue – and emphasize the width of the car. A spoiler extends from the rear hatch at higher speeds. The luggage compartment, which is reinforced by a solid crossbeam beneath the rear shelf, has a capacity of 300 liters (10.59 cubic ft). 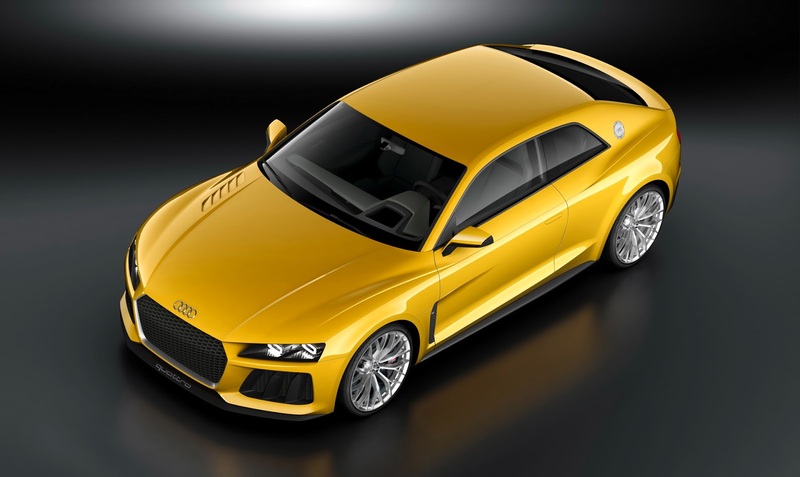 The plug-in hybrid drive makes the Audi Sport quattro concept a breathtakingly dynamic coupe. System output is 515 kW (700 hp); system torque is 800 Nm (590.05 lb-ft). Power flows through a modified eight-speed tiptronic to the quattro powertrain, which features a sport differential on the rear axle. According to the applicable standard, the show car consumes on average 2.5 liters of fuel per 100 kilometers (94.09 US mpg), a CO2 equivalent of 59 grams per kilometer (94.95 g/mile). The combustion engine is a four-liter, twin-turbo V8. It produces 412 kW (560 hp) and 700 Nm (516.29 lb-ft) of torque. The cylinder on demand (COD) system, which deactivates four cylinders under part load, and a start-stop system make the sonorous eight-cylinder unit very efficient. Located between the 4.0 TFSI and the transmission is a disc-shaped electric motor producing 110 kW and 400 Nm (295.02 lb-ft). It draws its traction energy from a liquid-cooled lithium-ion battery in the rear with a capacity of 14.1 kWh. The show car is charged via an Audi wall box, which uses intelligent charge management to ensure the optimal feed of energy to the lithium-ion battery. 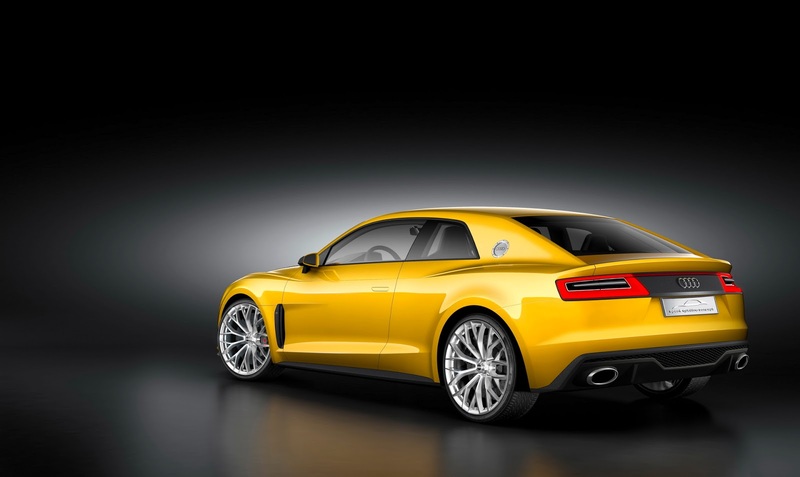 The Audi Sport quattro concept can cover up to 50 kilometers (31.07 miles) on electric power alone. An intelligent management system controls the interplay between the two drives as needed, and the driver can choose between various operating modes. In EV mode, only the electric motor is active. With a peak electric output of 110 kW and 400 Nm (295.02 lb-ft) of torque, electric driving both inside and outside the city is possible. An active accelerator indicates the transition to hybrid operation to the driver so that he/she can consciously control the switch between electric and hybrid vehicle. When the V8 and the electric motor work together, the Audi Sport quattro concept accelerates from 0 to 100 km/h (62.14 mph) in 3.7 seconds – much like the powerful Audi rally cars once did. Its top speed is 305 km/h (189.52 mph). The lightweight construction concept also plays a large part in this dynamic performance. The occupant cell combines ultra-high-strength steel panels and cast aluminum structural elements. The doors and fenders are made of aluminum, and the roof, the engine hood and the rear hatch are made of carbon fiber-reinforced polymer. The result is a curb weight including the battery pack of just 1,850 kilograms (4,078.55 lb). 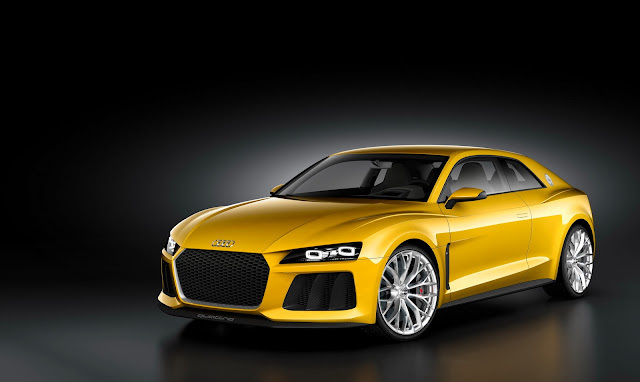 0 Responses to "AUDI SPORT QUATTRO CONCEPT"